For a truly exceptional Wedding Disco, look no further! With over 250 Five Star Reviews, we supply the ultimate in tailor-made Wedding Entertainment – all your favourite songs from dance floor classics to the latest hits, state-of-the-art sound system and light show, carefully managed flow and atmosphere to your precise wishes – all with the personal touch of our award winning and ever-popular DJ Richard! We offer full consultation and free advice – playlists welcome, we guarantee to play ALL your “Must Haves” – our proven reliability ensures your Wedding Party is a total success. Share your ideas and wishes with us – we draw on years of experience to design the perfect party just for you. From a life-time in entertainment, we know exactly what songs to play to suit every age and taste! – your Wedding Party will be unique, so we work with you to create a playlist and atmosphere tailor-made for you and your guests. We use state of the art sound equipment and lighting to create a pleasing and professional show, in keeping with your wishes and appropriate to the venue. We will act as your compere and host, making any announcements as required and supplying information so everyone knows what’s happening and what to look forward to next! You can delegate as much or as little responsibility to us as you wish in the role of wedding disco entertainer, including as Master of Ceremonies and Compere. RTM Event Music are happy to act as your personal representative – setting up your First Dance, organising cutting of the cake, liaising with the venue when food is to be served, providing microphones or background music as required. We will introduce other entertainers, such as a Live Band, Magician etc, so that the flow of the evening continues smoothly… We take care of every detail, just as we planned, so you are free to simply relax, have fun and enjoy yourselves! Fully Prepared and Ready On Time! Always arriving at least 90 minutes before your wedding party, we guarantee to be ready when you are! No breaks are taken throughout the evening, so your party will continue to flow smoothly. Setup is usually from 5.30pm to 7pm, with background music played until the first dance. Kids requests can be taken during this time, if the bride and groom prefer. Live music is played as required from 7pm to midnight (extra hours by arrangement if the venue permits). We are experts in creating a natural flow of energy, volume and tempo throughout the night – your party will be guided by the ebb and flow in the room. We carry spares of every piece of equipment, and have full Public Liability Insurance of £10 million. 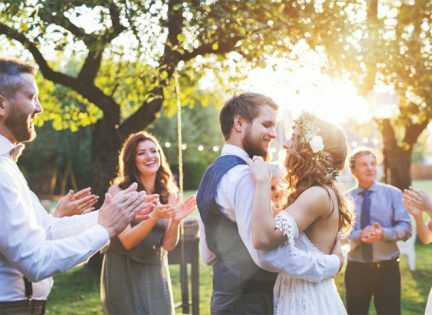 Your Wedding Party is an essential part of the day – time to relax and have fun after the formalities, celebrating in style with family and friends. Weddings in Devon and Cornwall can be the most beautiful of all! The South West boasts an incredible range of fabulous Wedding locations – many of which we work in! From stunning Castles and Hotels to beautiful Barns and Country Houses… With years of experience in the finest venues, we provide the extra sparkle so your Wedding Party rounds off the perfect day – See over 250 Five Star Reviews Here. We can supply “Text your Request” leaflets on every table – your guests can choose favourite songs or send messages without leaving their seats. This service is incredibly popular, Wedding Guests love it! We can also supply free request slips to go out with your invitations if required.